correct as of 19 January 2015.
correct as of 14 June 2015.
correct as of 11 November 2012. 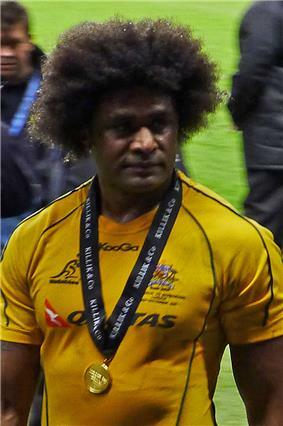 Radike Samo (born 9 July 1976 in Nadi, Fiji) is an Australian rugby union player. He plays lock, flanker, number 8 and can even play on the wing. Between 2000 and 2006 Samo played 35 games for the ACT Brumbies. He played with the Fiji Under-19's national team before winning 6 caps for the Wallabies in 2004. In the summer of 2006, he signed a two-year contract with French giants Stade Français after rejecting an offer from Cardiff Blues. He scored a try on his debut with the Paris team after just 6 minutes (v ASM Clermont Auvergne, 30 August 2006, 45-15) and the winning try in the French Championship final against the same team in Stade de France on 9 June 2007, after scoring against Biarritz Olympique in the semi final, both times coming off the bench. In April 2010, he returned from Japan to play for the Southern Districts Rebels in the Shute Shield competition, before joining the Queensland Reds on a short term contract as cover for James Horwill. He started off slowly but after several games he was dubbed "outstanding" by Reds coach Ewen Mckenzie. He continued with the Reds in 2011, playing in the team's Super Rugby final triumph on his 35th birthday. The following day it was announced he had been called up to the Wallabies 40-man squad for the Test against Samoa, and TriNations series against New Zealand and South Africa. He scored his first test try for the Wallabies during the final Tri-Nations and Bledisloe Cup match against the All Blacks in Brisbane on 27 August 2011. This try was later selected as the IRPA Try of the Year 2011. At 35 years old, Samo is the oldest player to play for Australia in a Tri-Nations match. He, unusually, played on the wing for the Wallabies 2011 Rugby World Cup match with Russia, in place of the injured Drew Mitchell. It was announced on the 16th of January 2015 that he had signed with the Melbourne Rebels. Won 3rd place with the wallabies in the 2011 world cup. Recalled into the wallabies 30-man squad for the 2012 Bledisloe cup and inaugural rugby championship. ^ Morton, Jim (7 April 2011). "Reds muscle up for Stormers". Brisbane Times. Fairfax. Retrieved 2012-02-26. ^ "World Rugby Awards Past Winners". worldrugby.org.